High School Math based on the topics required for the Regents Exam conducted by NYSED: The Number e and the Natural Logarithm, Common Logarithms and Natural Logarithms, Evaluating Common Logs and Natural Logs Using a Calculator. 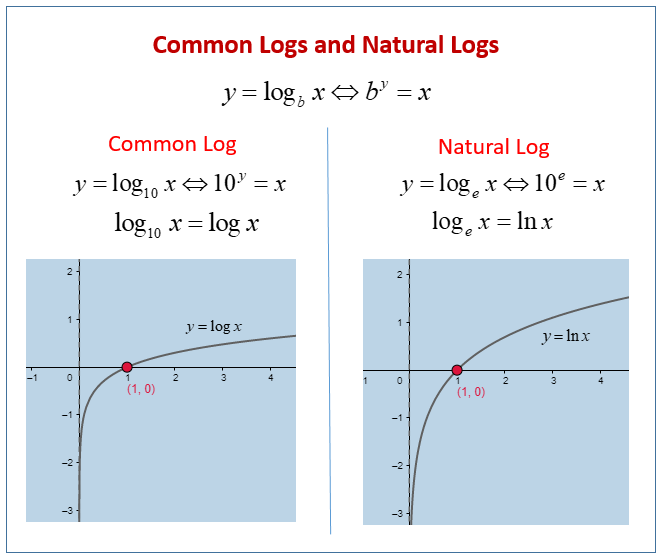 The following diagrams show common logarithms and natural logarithms. Scroll down the page for more examples and solutions. The natural log is the logarithm to the base of the number e and is the inverse function of an exponential function. Natural logarithms are special types of logarithms and are used in solving time and growth problems. Logarithmic functions and exponential functions are the foundations of logarithms and natural logs. This video looks at properties of e and ln and simplifying expressions containing e and natural logs. It includes five examples.